I actually bought these silverware for my son, but one day I was out of plastic silverware and decided to use one of these. 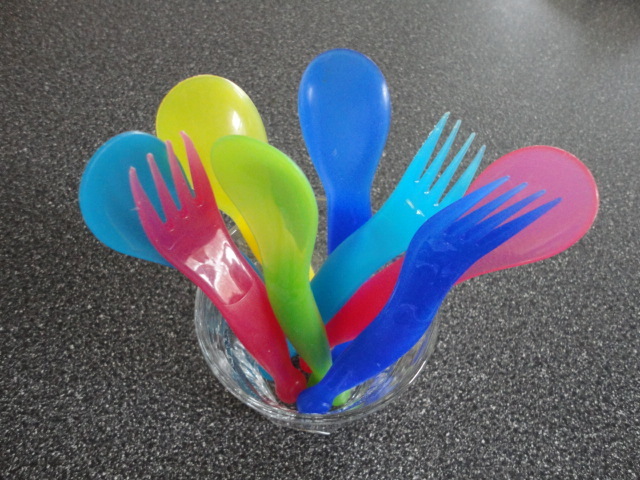 They have now become my silverware of choice for packing lunches. Even the knife when you need one works, maybe a little bit dull but it usually can get the job done. Happy Packing! What’s on your packing menu for the week? Egg salad is on mine. Cool! I like their silverware. I have the metal ones. I like it because it’s affordable so if something accidentally happens to it, it’s not a big deal. I don’t have too much new on the menu for this week. I made some spinach walnut pesto pizza on Sunday so that gave us lunches for yesterday and today. Will probably be making pasta alfredo, some sort of rice noodle dish (I love thai inspired rice noodle dishes), and I got a good deal on a bag of yukon gold potatoes so I’ll probably be making this north african potato dish. It’s from the cookbook Classic Vegetarian Cooking from the Middle East by Habeeb Salloum. It’s a simple but tasty dish. Potatoes, cilantro, garlic, lemon juice, etc… It’s filling and cheap to make! Yippee! Thanks! Affordable is key and they are durable and reusable. Your leftoever lunches sound really good. Do you make your own dough for the pizza or do you buy pre-made? This summer I would like to try my hand at grilling a pizza. My dough making abilities aren’t too great. I make my own. Here’s a link to the recipe on my blog. It’s the same dough I use for calzones/hot pockets. Oh, and see if the library has the “Street Food Chicago” book. It has a great Sicilian Bakery Style Pan Pizza recipe. Makes a totally different style pizza but it is yummy. That dough has to rise for a long time so I only make that one on the weekend. You make that one in a rimmed baking pan.